FAQ - Questions About Fire Alarm Systems - Current Technologies Ltd. Initiating devices, capable of placing the system in the alarm state. 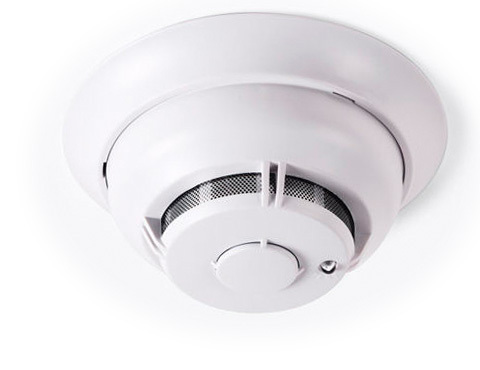 These can be photoelectric smoke and heat detectors, ionization smoke detectors, heat detectors, in-duct smoke detectors, manually operated pull stations and sprinkler water flow sensors. Indicating appliances, whose purpose is to announce building occupants or at a remote location when the system enters the alarm state, such as horns, strobe lights, chimes, bells, or combination units. They are also available in weatherproof and hazardous location versions. 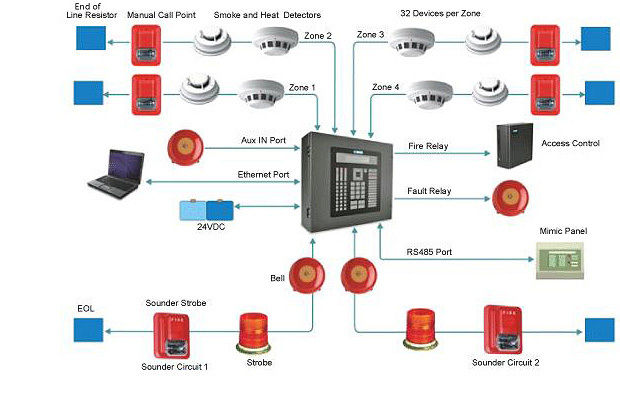 A typical fire alarm system has numerous initiating devices divided among separate zones - each connected via an initiating device circuit to a central control panel. 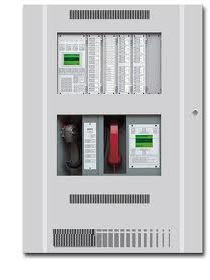 The control panel performs supervisory functions over the initiating devices, indicating appliances, all associated field wiring, telephone ties, and its own internal wiring and circuit cards. What is the main component of a fire alarm system? The Fire Alarm Control Panel (FACP). The FACP should be located where it can be responded to as necessary either around the clock or during operating hours. This can be at building security headquarters, adjacent to a telephone switchboard or in a maintenance office - whichever location offers maximum coverage. It should also be positioned in a fairly central location because if the system goes into alarm, a person needs to be able to race to the location and verify fire status before the alarm is silenced. How does a fire alarm system operate? 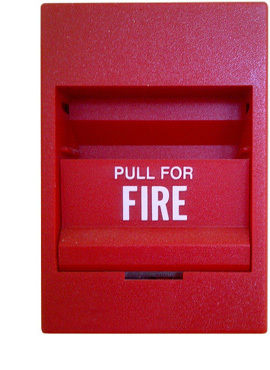 A fire alarm system operates in one of three (or more) states: normal, alarm, and trouble. The state is reported at all times on the alphanumeric display. If the system goes into alarm, the indicating appliances throughout the building go off. These could be very loud horns for some occupancies, or softer chimes in others, such as a nursing home.